1. Heat the one tablespoon of the olive oil and one tablespoon of butter in a medium Dutch oven or heavy sauce pan over high heat. Sear the mushrooms until they begin to darken, but not yet release any liquid — about three or four minutes. Remove them from pan. 2. Lower the flame to medium and add the second tablespoon of olive oil. Toss the carrots, onions, thyme, a few good pinches of salt and a several grinds of black pepper into the pan and cook for 10, stirring occasionally, until the onions are lightly browned. Add the garlic and cook for just one more minute. 3. Add the wine to the pot, scraping any stuck bits off the bottom, then turn the heat all the way up and reduce it by half. Stir in the tomato paste and the broth. Add back the mushrooms with any juices that have collected and once the liquid has boiled, reduce the temperature so it simmers for 20 minutes, or until mushrooms are very tender. Add the pearl onions and simmer for five minutes more. 4. Combine remaining butter and the flour with a fork until combined; stir it into the stew. Lower the heat and simmer for 10 more minutes. If the sauce is too thin, boil it down to reduce to the right consistency. Season to taste. 5. To serve, spoon the stew over a bowl of egg noodles or spaetzle (recipe follows), dollop with sour cream (optional) and sprinkle with chives or parsley. 1. Combine the flour, baking powder, salt and nutmeg. 2. Beat together the eggs and milk or water. Add the flour mixture. Beat well with a wooden spoon to create a fairly elastic batter. 3. Bring water or broth to a simmer in a large pot. Drop small bits of dough from a spoon into the boiling liquid or force the batter through a spaetzle machine or colander. Spaetzle are done when they float to the surface. They should be delicate and light, although slightly chewy. If the first few are heavy and dense, add a few more drops of milk or water to the batter before continuing. 4. Serve with melted butter (or alongside a gravy-heavy dish like bourguignon). Or melt butter in a skillet, add spaetzle and cook 3 to 5 minutes. I really want to try making spaetzle someday. That and homemade pasta. On the bucket list. 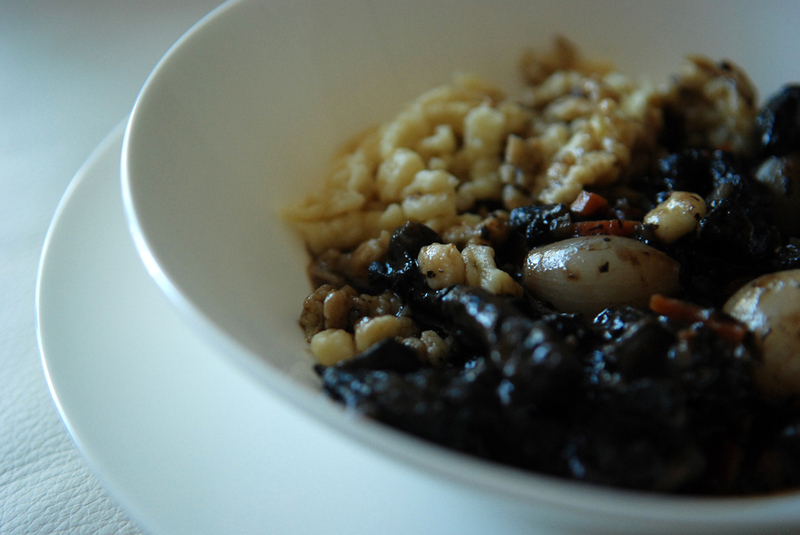 I saw this bourguignon on SK’s site and fell in love. I’m not sure a meat eater either. It must have been awesome paired with the spaetzle. Also over risotto or polenta…two of my favorite carbs. Great dish for the event. Thanks for participating. I really love Spaetzle! Her is the roundup and the voting! Have a look!